Python is a great language for the on-demand style of Lambda, where startup time matters. In terms of execution speed, there are better choices available. 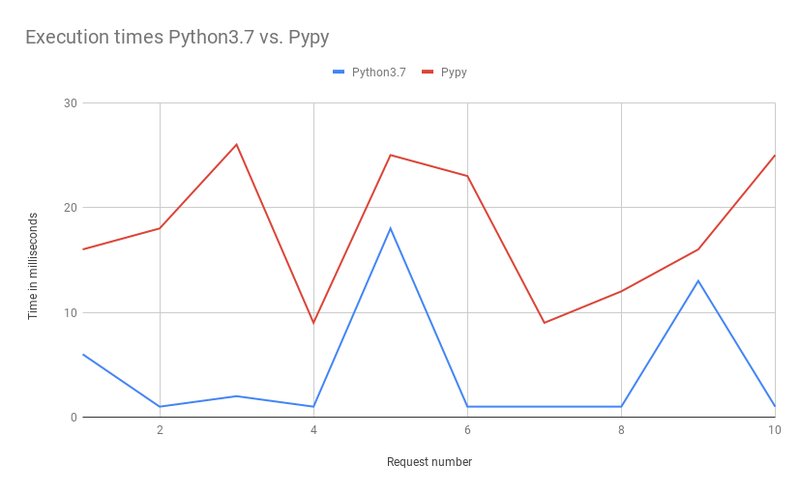 Where computational performance matters one improvement is to use Pypy, the Python interpreter with a JIT compiler. It can execute the same code much faster. There is just a slight penalty in startup time compared to CPython. I was curious how Python and Pypy would compare on AWS Lambda. As Amazon announced recently, it is now possible to provide your own Runtime for Lambdas. Before you can start with creating your own runtime you should have a simple Lambda function. I recommend you start by creating a serverless application. This way you not only get a plain Lambda but also an API Gateway and Cloudwatch logs set up. And it is much quicker to edit code, iterate and put it to version control. Creating a new runtime is based on a shell script you have to provide. This script will do initialization work, call an interface for requesting the next task/incoming request, dispatch it to whatever runtime you are providing and respond to another interface with either a success or an error message. Starting from the example is easy. You can quickly set up a test project using serverless that will execute the example bootstrap code. The example runs in an endless loop, working on one task in each iteration. AWS must be starting/killing this loop based on how many tasks are waiting for execution and probably some other factors. Pypy does not run out of the box. The interpreter has to work on Amazons Linux environment. Unfortunately, downloading a compiled binary didn’t just work for me. And I couldn’t find a version specifically for the Amazon Linux. The problem is that a libbz2 library was not available. In fact, it is available in the environment but Pypy does not find it. The recommended solution to create a symbolic link to the library is also not an option, because the environment is read-only (except for /tmp/). To not spend too much time on this I fired up an EC2 instance with the Amazon default image and copied that library next to the Pypy interpreter into my package. To create a first “Hello World from Pypy” application running you need to call Pypy from within the shell script and send the response back to the Runtime Interface. There is no error handling yet and starting a new Pypy process on every request is far from optimal, but this is already a working solution. For sure there are better algorithms to do the same thing, but it serves the purpose well. Calculating the prime numbers takes considerably longer with CPython than with Pypy. On my machine, it takes around 1 second with Pypy and 3 seconds with CPython. 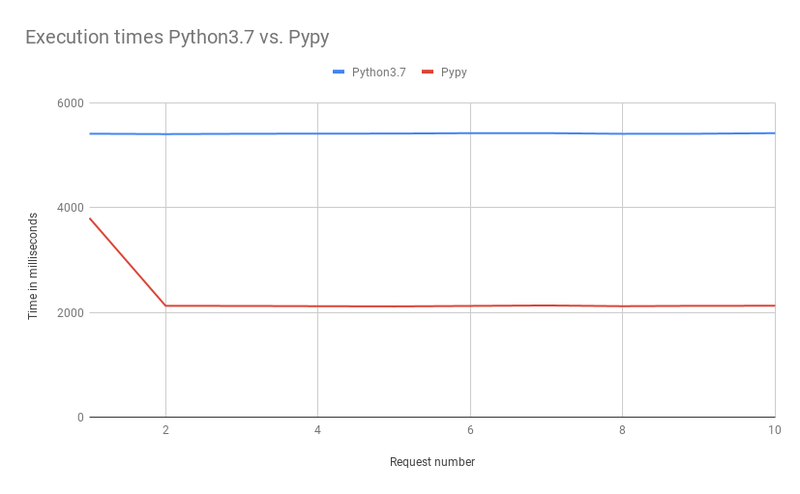 Calculating the primes takes more than 5 seconds when executed with python3.7 but only slightly above 2 seconds with Pypy. We have found a case where Pypy is a lot better than CPython. This was my hope when starting to build the runtime. But, as you can see in the first request, the Pypy runtime takes a long time to initialize. This is logged in CloudWatch as “Init Duration: 1641.69 ms”. In this test scenario, it does not matter because a request takes many seconds to finish. With its better computational performance, the Pypy runtime still comes in first. In a more typical scenario, this Init Duration will be much more important. And this brings us to the downsides of this approach. The initialization phase takes way too long. It is not visible what exactly happens during that time. But the bulky size of the code package will most likely be part of it. The execution time for a “Hello World” application is higher than with Python. I don’t understand why this is the case. Monitoring Pypy runtime_interface gives me sub-millisecond times for what my code executes. Still, the Lambda execution Duration is reported to be somewhere between 10 and 30 ms. In contrast, executing the function with Python3.7 gives Durations close to 1 ms with only a few spikes. This should be more or less equal. There either is a problem in my implementation or in how AWS handles a Custom Runtime. If you have an idea what goes wrong here please add a comment. In any way, this diagram is much closer to real-world usage. And Python is faster here. Also, the deployment package is big. Nearly 30 MB are uploaded to S3, even though there is hardly any function code inside. For many cases, this is going to be a showstopper. I believe the package size can still be reduced by specifying in more detail which Pypy files are necessary. If Amazon ever considers this as a default choice it would solve the issue, because then you would not have to upload the interpreter within your package. Running Pypy on AWS Lambda as a custom runtime is possible and not very complicated. There is a clear advantage over CPython when it comes to long-running computations. Packaging the whole interpreter bloats up your Lambda package and increases your initial startup time. Typically, being lightweight and having a quick startup is more important than raw computational speed. Therefore, I can only recommend this approach for exceptional cases. If Amazon decides to provide Pypy as a default Runtime, this could be different. You would not have to bundle the interpreter and the startup time might become a lot better than now while the computational advantage of Pypy will still be there. You can find all the code in my Github repository. Serverless computing is a cloud-computing execution model in which the cloud provider dynamically manages the allocation of machine resources. At my current project, I had the freedom to create a new service a service from scratch and to relatively freely choose the technology stack. The only given was that it should either run inside the old datacenter or on AWS. Having experience with administrating root servers in the past, I also know how easy it is to fail at that task. It takes a lot of effort to keep a system up to date, adjust the configuration for changing requirements and handle hardware failures. With serverless services, like AWS Lambda, all this is abstracted away and handled by the Cloud provider. It auto-scales your service on demand when the load increases. Even better, AWS Lambda will only charge you for the number of requests. If you don’t use a service the only thing you pay for is the zip file stored on S3. Compared to a typical service based on virtual machines or containers, these benefits are huge. However, they also come with a downside. Most notably is the performance impact. AWS will kill idle Lambda instances and spin them up on demand. This means the service has to be loaded from S3, extracted and started when the first request in a longer period of time comes in. There are huge differences in the startup time of certain technologies. Node.js and Python are among the fast end, while Java with Spring takes a lot longer to start. As instances can be stopped at any time, this also affects caching strategies. There is a simple cache in API Gateway which caches full responses. It can be activated by checking a checkmark and setting the maximum size. However, many times you don’t want to cache the complete response, but pieces of information required to compute it based on the input values. It is possible to cache data inside a Lambda, but there is no guarantee about how long it will be available. This depends on the load, access patterns and probably how many resources Amazon currently needs. If you want more control you have to use an additional service like Elasticache. However, this part cannot be started on demand. As a central instance which has to be available and quickly serves requests, the cache has to be up and running all the time and you will be charged even when it is not used. In the case of my service, the load is high enough to make sure there is one Lambda instance running all of the time. It is not always the same instance, but changes are rare enough to provide a good amount of cache hits. Going serverless was a great choice and is superior to manually running a service in a container, VM or even the bare metal in many ways. It provides the option of scaling to nearly an infinite amount of requests (whatever Amazon can handle) without the hassle of configuring complex auto-scaling strategies. But there are important mobile aspects where the web still fails to deliver. 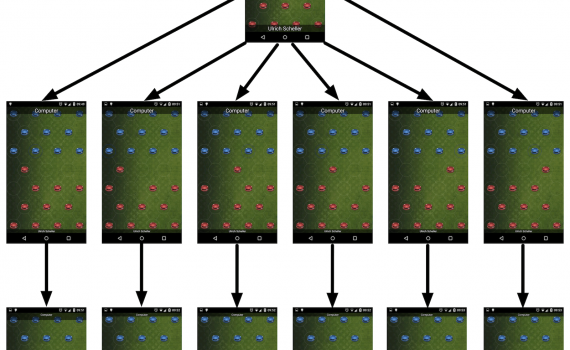 First and foremost there is no layout mechanism that matches Androids way of developing for multiple screens. Unlike on a desktop, where pixel density has been relatively stable for a decade, on mobile devices it can be completely different. A normal phone screen might have a resolution of more than full-HD, while a 10″ tablet still has a HD-ready resolution. A single pixel is much much smaller on the phone than on the tablet. If you are designing your website with pixel sizes, your graphics might have the right size on either of them, but not on the other. The normal solution in the web world is to use percentages of the screen size instead of hard coded pixels. This solves the problem above, but introduces a new one. What is the right image to show if it stretches to some percentage of the screen? It should be big enough to use the great phone screen, but not bigger than necessary to save bandwidth and keep page loading times low. A related problem is to size a button correctly. You want to have the size of a button approximately match the size of a fingertip, so it can be pressed easily without taking too much screen space. This works neither with pixels, nor with percentages of a screen. If we want to solve this problem, we first have to understand that this is not a one-dimensional problem. Size is not the only parameter we have. A users device can be on any position in these two dimensions: [small – large] X [low dpi – high dpi]. Android uses resource folders for both dimensions, where each device chooses its correct format. There is an explanation in the designing for multiple screens documentation. Another thing is integration into the system. How do you create an Intent? How do you set an alarm? What about receiving Push Messages? If your app doesn’t need these features that is fine. But working around the limitations of a web container with native bridges enforces you to maintain both native for several platforms and web content. And finally the promise of “develop once, it works everywhere” is simply not true for web technology. Different browsers behave differently and websites are cluttered with special case handling for certain clients. You still have to test and maintain how your web app looks on iPhone, iPad, several Android phones, browsers and other platforms you care about. And I am not yet talking about a platform-specific look and feel. However, there are certainly cases when a web application makes a lot of sense. If you are mainly mirroring website content, it probably is a good idea to reuse much of your existing website. Even I, as a strong native promoter, have chosen to develop a web application in my last project. The project was about using a tablet for controlling hardware, in this case to control several lights and display videos in a car prototype. Besides the pain points explained above a web application has its own strengths like being available without installing. Another reason for not using a native approach was the server part. If there is a (web) server anyways, it can as well serve web content instead of just data and instructions. A native app would require one more layer on top of everything. Most drawbacks mentioned above don’t apply for this case. The system includes one specific set of tablets, so it doesn’t have to adapt to multiple screens. The simple layout does not depend much on resolution and dpi, because most of it is text and vector content. The only image used is the background. And there is no system integration necessary. Above is a simplified version of the app, that I use for development. It is connected to a 4-channel LED (red, green, blue, white) to generate different colors. 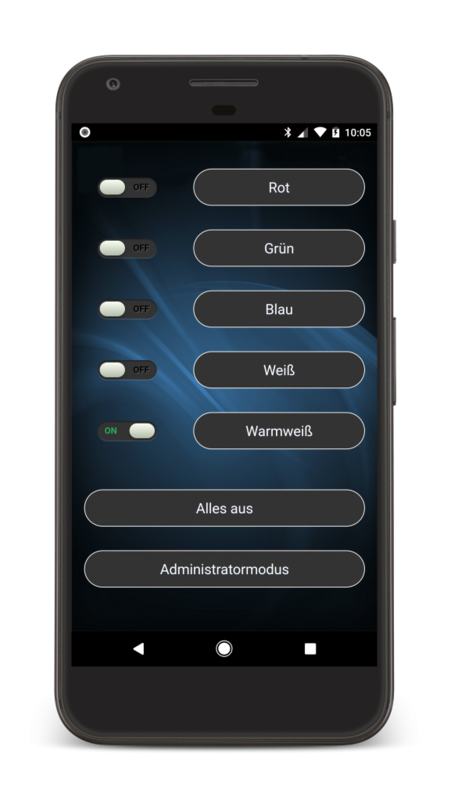 With the Administratormodus, you can modify color values of each channel. To make it feel more like a native app, it has a homescreen button and no url bar on top. 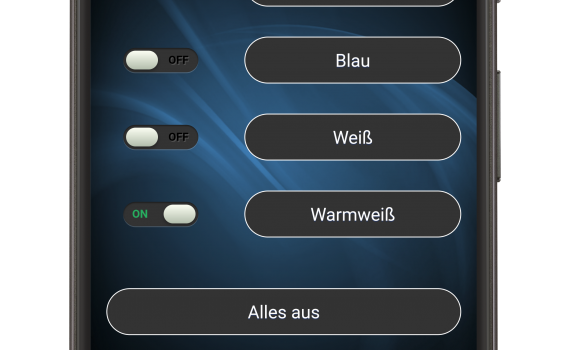 The application uses the whole available screen, except for the notification bar and the navigation buttons. It also features a splash screen while loading. This is easy to achieve, but goes a long way in making your web app feel like it belongs to the platform. Read more about it in Making Fullscreen Experiences. For this project, I believe it was the right approach. The customer is happy with a lightweight and clean solution. But it was a special case in a well defined environment. For most consumer apps I still recommend native development. Virtual Reality is a hot topic these days. A few weeks ago I had the opportunity to test an Oculus Rift with Touch Controllers. PlayStation VR and HTC Vive have also been released lately. Android Developers like me have their Cardboards, which are a very low-cost option. With the release of their Pixel devices, Google announced the Daydream VR. Similar to the Cardboard, you place your mobile phone in the VR headset and don’t need additional high-end hardware. For 70€ it is still a low-cost solution, if you don’t factor in the expensive phones. My first attempt at trying Daydream VR unfortunately was not successful. I got the small Pixel phone, which worked flawlessly except when being used in the Daydream VR headset. It had regular reboots, a problem many others around the web have as well. And even worse, it had extreme visual drift as you can see in the video below. It is hard to tell how bad that visual drift is. Your vision turning around while your body tells you there is no change in orientation makes you feel sick within a minute. So after playing around an making a factory reset, I decided to return the device and get the Pixel XL instead. Turned out this was a good choice. With the Pixel XL everything works flawlessly. Head tracking has no noticeable delay and the touch controller works great. Compared to a Cardboard this setup is a great improvement. A Cardboard only has a single button for user interaction. The touch controller gives navigating a whole new dimension. In games it is used as a magic stick, for controlling a steering wheel or tilting a playground to move a ball around. Every game seems to have its own way of navigating around. I believe we will see a lot more navigation styles before a few will crystallize as standard. While Daydream with the controller is much better than before, you also see what is still missing. Turning your head around works great, but moving is not possible at all. In a VR world like Fantastic Beasts I want to move around and look at the beasts from all sides. In most of the applications this is not possible. Graphics are pretty good with the right game/application. The detail level is impressively close to an Oculus Rift. However, in both VR systems you recognize single pixels. Even a resolution of 2560×1440 pixels is not much in VR mode, because it has to split for two eyes and fill the whole viewport. But every current VR system has this problem. Should you go for self-employment? I am now 9 months into my career as a freelance consultant and would like to share my experiences with it. The question if you should make that switch too depends on many factors and can not be answered in general. Much of it is about yourself rather than the outside world. This is the important question to ask when someone created a company. During the last 9 months I had a constant stream of work which was paid much better than all my time before. And this is despite me stepping back from managing teams of 20 developers to writing software myself. Because a developer has less responsibilities and less meetings than a team lead, it is much easier to take a day off. This is very valuable to me as a paraglider, as it strongly depends on weather conditions. Last year I had several incredible (for myself) flights and great experiences. Before, I was trying to achieve this year after year as an employee, but there was always some important meeting or another reason preventing it from happening. On the other hand I sometimes miss being important. I enjoyed creating teams of developers and optimizing the way we work on many layers. I also enjoyed being responsible for products with millions of active users. However, this is not typical for most employees but rather a special case of my previous role. And the fun was declining more and more at the end in favor of company politics, pushing Excel-Boxes and taking part in software-design-committees. So overall, yes, it worked out very well. I am much more relaxed, more happy and being self-employed gave me the biggest income-boost I had by far. This depends a lot on what you already know and what type of person you are. Obviously there are some hard parts to creating your own company. The hardest is that you will be responsible for everything. You have to find customers yourself, sell yourself as valuable to their project, handle all the paperwork and taxes and never break any law. Many of us hate responsibility. I am not talking about being responsible for finding a restaurant for dinner tonight. I am talking about make a big mistake and you go to jail-responsibility. If you are that type of person, you will probably find it difficult. I was lucky to be responsible for several teams of developers in my last job. So my mind was already prepared for having lots of responsibility. Additionally, I have been self-employed part-time during university. So when I tell you it is not hard at all, take this into consideration. For many developers this might be a bigger change. In Germany, there is a subsidy for founders coming out of unemployment called Gründungszuschuss. I urge anyone interested to further look into this, as it basically is free money for nothing in return. The Gründungszuschuss is an incentive for unemployed people to start their own business. I will not go into more detail here, but it is pretty easy to become temporarily unemployed. I knew this subsidy existed but I never believed I would be eligible for it. I needed my tax advisor telling me that in fact I was. You probably need the same in other cases. Talk to people in a similar situation and read about it. But most importantly, once you choose to become self-employed, take action. So currently I am really happy with my situation. I have a lot of personal freedom, 3 days of home office per week and a good pay. Should you do the same? That depends on your own situation, but in many cases it is a big win. Drop me a note if you are considering it. My last post about implementing a turn based game ai became famous on Reddit/Programming for one day. It looks like many developers are interested in this topic. Some readers, with more knowledge of the topic than myself, have added interesting insight that I would like to share with you here. If you haven’t read the first post, you might want to have a look there first. The algorithm that I presented is called Minimax and is famous in academia for creating turn based game AIs. It has this name, because one player tries to minimize the getValue() result and another player tries to maximize it. For improving the AI strength you either have to improve your getValue() function, or increase the size of your decision tree. Usually, getValue() can only be improved to a certain point which is far from perfect. Therefore, at some point you want to focus on increasing the tree size. This means looking more half-moves into the future. 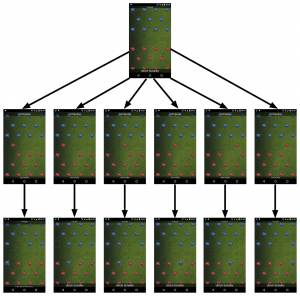 We can increase the tree size simply by using a higher recursionDepth value. It depends on your game, which value is good enough for a strong computer AI. 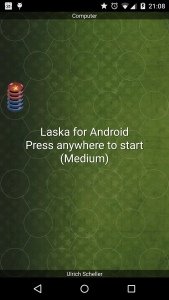 Laska is using a recursionDepth value of 4 for the strong computer player, 2 for medium and only 1 on easy. This is good enough, because I want my users to win most of the time. 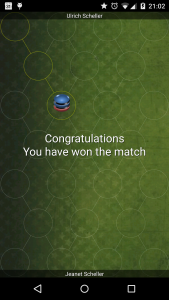 I want them to enjoy beating a hard computer opponent if they are good players. If your AI should be more competitive, you need a higher recursionDepth. The problem is, that you will soon have a high runtime complexity and calculation time. If we have a Branching Factor of b and a recursionDepth of d, we have a complexity of O(b^d). So let’s say Laska has 4 possible moves on average and I am using a depth of 4. Then my AI is crunching through 4^4 = 256 situations, calculating and comparing their value. This is not very much and also the reason I never had to optimize. On the other hand, if you are implementing a chess AI the branching factor is 35. There is much more competition in this game and you might want to have a depth of 8. Then you are looking at 35^8 = 2.251.875.390.625 situations, which obviously is too much. In this case you should focus on further optimizations. The most important is called alpha-beta pruning. It will cut off subtrees whenever they can not influence the root decision (making a single half-move) anymore. When can this happen? Every move could turn around the game instantly. In chess, you could be way behind in everything regarding your getValue() and still make a checkmate within a few moves. So how can you ever discard a whole subtree? It is true that at some point you have to consider every possible move. However, when we know there is a winning path, we don’t need to figure out if there are more in this subtree. If we have a winning path down the tree, we just start with the first move. This goes both ways. If we have a path that definitely gives us a loss, our opponent will choose exactly that path. We don’t need to evaluate any other moves from his side. On the left side we have the situation described above. The rows in red mark red moves and the ones in blue stand for blue moves. Blue is minimizing the value, while red is maximizing it. So on the lower left side, when blue has to choose between 5 and 6, we know that he will choose 5. In the next subtree, blue can choose between 7, 4 and something else. We can already stop at 4, because whatever number comes, this is already the preferable subtree for blue. We don’t need the correct value, as long as we still get the optimal move. 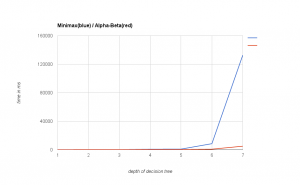 Alpha-beta pruning makes a huge difference when the decision tree is large. According to this link, it reduces the number of leaves to the square root. So if we use the previous example with 2.251.875.390.625 leaves, we only have to check 1.500.625 situations. That is still a high number, but not impossible anymore. So how does the alpha-beta pruning look in a game like Laska? The bestMove() method still looks much like the old version. It now calls alphaBeta() instead of getValueOfMove(), but both will return the value of a given move. The alphaBeta() value is negated and the method takes parameters for alpha and beta, in this case +/-SOME_HIGH_NUMBER. Also alphaBeta() didn’t change too much. At first, there is the recursion termination. When depthleft equals 0, we just calculate the current value and return it. If we are not in a leave node we calculate all possible moves. If there is none, the current player has lost the match and we can return a -1000 here. Otherwise we continue walking through the tree. Just this time we pass parameters for alpha and beta. Alpha notes the highest value of a move we are interested in and beta the lowest. If the current move has a score higher than beta, we can prune the graph here and stop calculating further, because the other player will not let us make this move. Otherwise, if the score is higher than alpha, we have found a better move and need to save it. 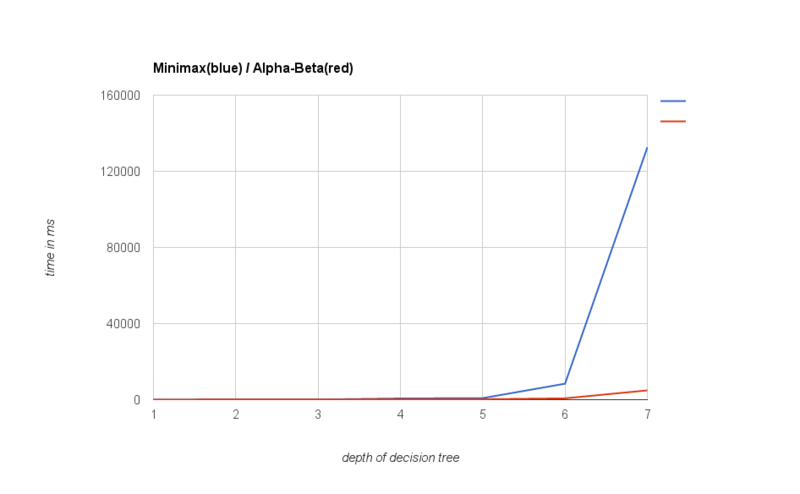 To see how much the alpha-beta pruning impacts performance, I ran a test case with the old algorithm playing against the new version with increasing depths of the decision tree. In the following diagram you see the time used for playing a complete game (up to 100 moves or until we have a winner). As you can see, there is no visible difference for depths up to 5. Alpha-Beta is considerably faster at depth 6 and it totally owns Minimax on depths greater than this. While this improvement is dramatic for higher depth levels, we can still do much better. Some further improvements are independent from your game, some depend on special knowledge about it and others trade a little accuracy for increasing the depth of your tree. The next optimization you might want to look into is ordering of moves for improving alpha-beta pruning. How you order your possible moves impacts how well the alpha-beta algorithm prunes the graph. If you start with best moves first, it can cut off more of the tree later on. There is a great overview of further improvements on StackOverflow. You can dedicate a lot of time to this. However, don’t forget to check if your algorithm is already good enough. Because if the main task is not beating Garry Kasparov, you probably should improve user experience, design, marketing, etc.. first.